As the French referee Stephane Lannoy signalled the end of the stoppage time, a unanimous emotion of disdain bestirred amongst the capacity crowd at San Siro. Stand-in captain Gennaro Gattuso much apparently could not fathom what just happened, got driven by a momentary temptation and involved himself into something that may well earn him a few disciplinary cautions from UEFA – he is anyway not going to feature into the second leg at White Hart Lane courtesy the caution he earned during the game. At the heart of Gattuso’s actions, was the utter remorse and affliction for having been undone at the home turf by a team that in comparison to the Rossoneri are neonates to say the least. Not so long ago, San Siro used to be a fortress where even the monsters feared to tread. Teams coming in from different leagues were dealt with ruthlessness and brutality. The defence of the opponents used to be shredded apart and they were bettered in every tactical and mental aspect of the game. Gone are those years however, as yesterday for the third time in four years AC Milan came second to an English top division side at San Siro. The defeats at the hands of Arsenal and Manchester United were not motivation enough for the Rossoneri to return the favour, as the juvenile team from North London too elongated the nightmarish run for Milan against the English teams. At the end of the first leg, the score reads 1-0 in the favour of Spurs, with all to play for in the second leg, at White Hart Lane. Sanity suggests that the game is over by no means, as overturning a single goal deficit is no herculean task. However, it is the magnitude of a defeat at home pitch that makes everything appear already lost. A lot can be strategised for the second leg action and a much more detailed action plan may be dwelt upon by Massimiliano Allegri. The question that torments the Milanistas, at this point in time, is what went so horrendously wrong in what was considered to be the more comfortable of the two legs for the seven-time European champions? TheHardTackle puts together all the events that unfolded at San Siro last night and analyses as to where Milan lost the battle and subsequently Spurs conquered. Though the scoreline suggests it to be a modest 1-0 defeat, the match was never short on tempo, action and drama. Milan did produce their moments of brilliance, but failed to capitalise on a single one of them. The starting formation for Milan raised a few questions right from the word go; but to be fair to Allegri, the growing list of injuries did not make his job any easier. Ignazio Abate’s return to full fitness cemented his spot on the right side of defence whereas Luca Antonini was almost certain to start from the left. The only aspect of their game that connects the two is that neither is a full back you desire to have in your team! The real surprise came in to see Mario Yepes pairing with Alessandro Nesta at the centre of the defence, as together the two have hardly featured in a competitive game and hence boast of little or no chemistry and understanding among them. In the modern day football, where most teams shift their play into the attacking third via a long ball from midfield, it becomes increasingly important for the centre backs to have a telepathic understanding among them. While Nesta is a no-nonsense defender, Yepes often tends to push a little too forward. Holding a high defensive line has never been Milan’s forte, as they have traditionally always defended behind the ball. In the midfield, Allegri fielded three holding, defensive players in Gattuso, Silva and Flamini. Gattuso, for all he has done for Milan, one must admit is way past his prime and is not the material to deal with pacy wingers. Thiago Silva manned the centre area in the midfield but positioned pretty deep, almost into the ‘Makelele’ role. Mathieu Flamini was his usual self on the right. He held an extra share of responsibility to provide cover for an incompetent Luca Antonini while dealing with Aaron Lennon but the Frenchman hardly tracked Lennon’s movements. The three-man attack for the Rossoneri comprised Zlatan Ibrahimovic and Robinho in a pretty narrow proximity, near the opponent’s penalty area, with Clarence Seedorf playing Trequartista right behind them. Milan’s first choice goalkeeper Christian Abbiati was taken off the field within the first half after colliding with Peter Crouch, in an attempt to clear the ball from an Aaron Lennon cross. This compelled Milan to field a relatively inexperienced keeper Marco Amelia but the demerits of this substitution hardly surfaced during the course of the game. While on paper, Allegri’s formation was a dynamic looking 4-3-1-2; the ‘3’ part of the system hardly involved itself into any build up. The wrong choice of personnel for these positions delimited Milan’s chances to device an effective supply line from midfield to the final third. None of the three midfielders have that natural spark of creativity to engineer a linkage with the attack. Moreover Clarence Seedorf’s movements were too stationary throughout the first half and never made any attempts to drop back and share the responsibilities with the midfielders to create something. This resulted into good 20 to 30 yard space where Milan heavily relied on long balls to meet the target, but that much seemingly did not materialise often. Frustrated with no supply coming in their way, both Ibrahimovic and Robinho started dropping as deep as to half-line on the pitch. With their quality skills on ball, both succeeded in winning against the Spurs midfield but with both of them choked and suffocated for space, they were out of choice but to pass the ball laterally, hoping the likes of Abate and Antonini would meet them. In the second half, the introduction of Alexandre Pato added flesh and blood to the Milan attack but more importantly, it was the removal of Seedorf that worked in their favour. Increased short passes and consequential fluidity immediately became evident and they were unfortunate not to have registered their name on the scoreboard through an unscrupulous header by Mario Yepes, only to be denied by an exemplary save by Brazilian goalkeeper Heurelho Gomes. Unlike his usual self, Pato did engage into duels with defenders, showed tremendous ball control and was instrumental with his artistry along with an imaginative vision for pass. He treaded a little deeper than the two strikers and fed them on multiple occasions, but the efforts failed to bear any fruits as Milan failed to finish the game on parity to level the terms. One of the basic errors in Allegri’s initial structure was that the three-man attack was pretty narrow in shape. Clarence Seedorf’s movement, off the ball, was pretty languid and never stretched himself out of his position. Ibrahimovic and Robinho are not known for their defensive instincts either unlike Samuel Eto’o who is as good as a fullback. This provided Spurs’ fullbacks acres of space into their own half to push the ball forward and deliver pin point crosses without the fear of losing the ball. The space and time allowed them to overlap both Flamini and Gattuso in process to make the ball reach to their wingers on the either side. 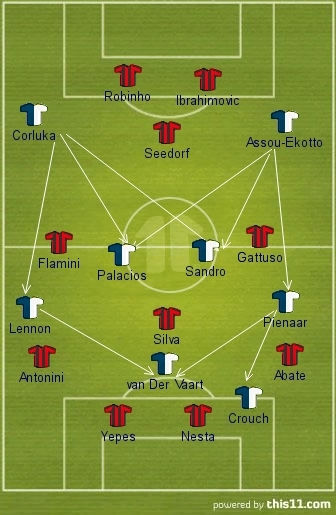 Once the ball reached the wingers, it was only a one on one with Milan’s shaky full backs and on most of the instances Lennon and Pienaar outpaced them and injected dangerous crosses. Milan were lucky enough not to concede in the first half, which included a survival of a very close hand-ball inside the box by Nesta, in the very first minute of play. 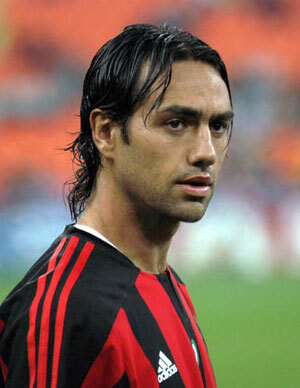 The CB pairing of Nesta and Yepes lacked proper communication and did not complement each other when required. There were instances when one tried to stretch himself on the wings and the other was caught out of position, leaving space to expose in the middle. However, neither can be entirely blamed for the goal that eventually came rightfully to the visitors. A misdirected pass by Ibrahimovic led the counter and Aaron Lennon comfortably outran, outplayed and outsmarted the veteran defenders. Once again the full backs failed to track back and midfielders were too advanced to provide support to the two men in defence. Lack of organisation in the back-line hurt Milan’s intentions to secure a lead in the home leg. Moreover, the ball distribution by Nesta too lacked creativity. A lot is left to be desired from this defence to support Milan’s cause to add to trophies to the cabinet this season. In all actuality, the away goal comes into picture only when the aggregate score remains the same at the end of second leg’s play. Should that be the case, quite logically Milan too would have scored an away goal which would neutralize the proposition. Therefore, all Milan need to focus onto is not let the momentum slip off their hands before going into the second leg. 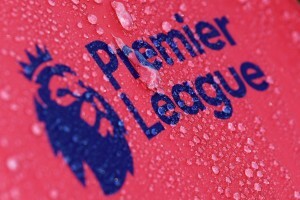 They play some important games in Serie A against the likes of Chievo and Napoli before travelling to North London. A couple of wins over these teams would boost their morale. Lacklustre display on field, devoid of any creativity or zeal coupled with disgraceful antics by players is how the day could be summarised. Easily a day to forget in the gleaming history at San Siro and the team must step out of murky waters at the earliest. I think it will be difficult for Milan to come back after this one. And if gareth bale is back, more problems!! Yes, it is going to be a difficult night at WHL. But I for one believe, Spurs will be no stronger than they were last night even with Bale joining the armory. And Milan too expect the return of Boetang and the Maestro, which should at least ensure a decent supply line to the attacking line. IMO this starting line-up has a potential to dismiss Spurs a chance to progress.